Honolulu, the capital of the Hawaii Islands and home to the State Capitol, is a year-round destination because of its moderate temperature. The beach city renowned for its natural attractions is undoubtedly a wonderful destination to visit. The sprawling city of Honolulu and Hawaii Islands’ vibrant epicenter has much to offer to its visitors. Here you will find it all – historic landmarks, a thriving arts and culture scene and world-class shopping. Some of the famous attractions worth visiting here include Pearl Harbor, Iolani Palace, Bishop Museum, Aloha Tower, Hawaii Theatre and many others. 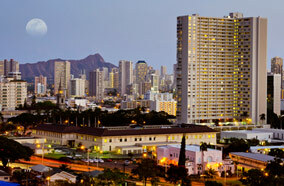 Honolulu is the place to head for a stress free and relaxed holiday. A number of airlines keep Honolulu well connected with Los Angeles. The flight distance of 2554 miles makes flights from Los Angeles (LAX) to Honolulu (HLL) possible to reach in approximately 4 hours and 49 minutes. Major airlines such as Continental Airlines, Hawaiian Airlines, American Airlines, United Airlines, Alaska Airlines, China Southern Airlines and others operate nonstop and on-stop flights between the two cities. Planning to travel from Los Angeles to Honolulu? 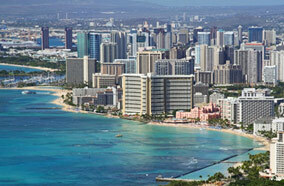 Take the help of our travel experts at Fare Buzz to get cheap airfares to Honolulu. Book online or Call today!